The Plan/Propose stage begins with forming a hypothesis or research question. It includes identifying a sponsor (whether externally-funded or internally supported), and developing and submitting a proposal. 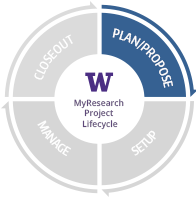 If the proposal is denied by the sponsor, the Lifecycle ends for the project, but may start anew as a new or revised proposal. Waiting times for a sponsor decision, whether a decision from an external sponsor to fund the research or an internal approval for the research project, vary considerably from project to project (could be weeks or years) and are included in this stage. Department administrators or grant specialists assist in preparing the proposal draft and the eGC1 if proposal will be submitted to an external sponsor. The Principal Investigator (PI) submits proposals for external funding through the department and school, for submission to the Office of Sponsored Programs, the office authorized to sign proposals. The PI is responsible for all aspects of the final proposal, with advice and support from administrators in schools and colleges, and central offices. Read and follow the sponsor guidelines for specific requirements. Determine project location, personnel, supplies and materials, methods, subrecipients, and compliance implications. Make sure your proposal meets all sponsor and University requirements. Create and submit proposal in SAGE on an eGC1 following internal GIM 19 deadlines.